Roughly 50% of all Americans who are diagnosed with a mental illness are also diagnosed with addiction at some point down the road, and vice versa. Mental health and substance abuse are proven top risk factors for one another — when one condition is present, the next is often soon to follow. 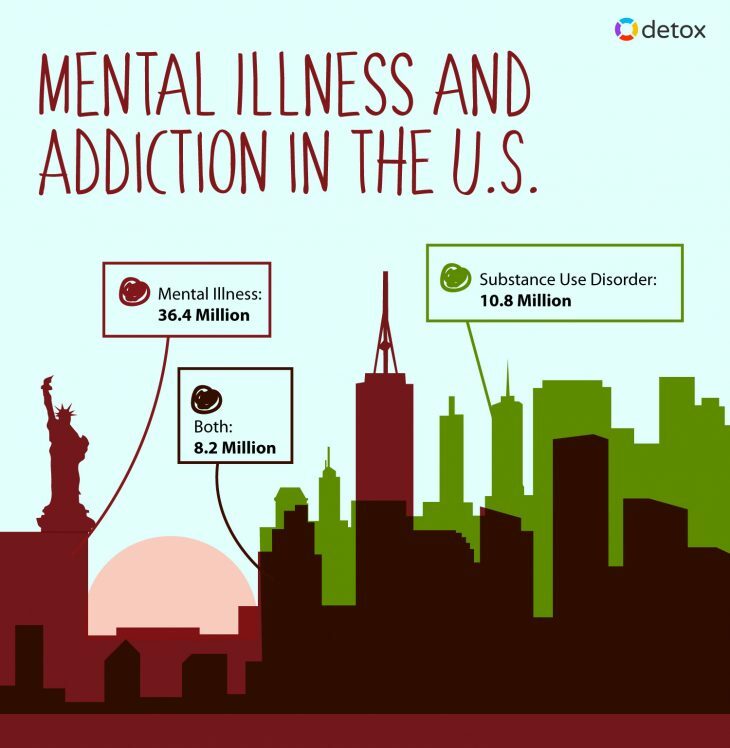 Unfortunately, mental health and addictions in the U.S. are usually either treated separately or not at all — meaning Americans are facing growing rates of mental illness and addiction unless the U.S. can close its treatment gap. 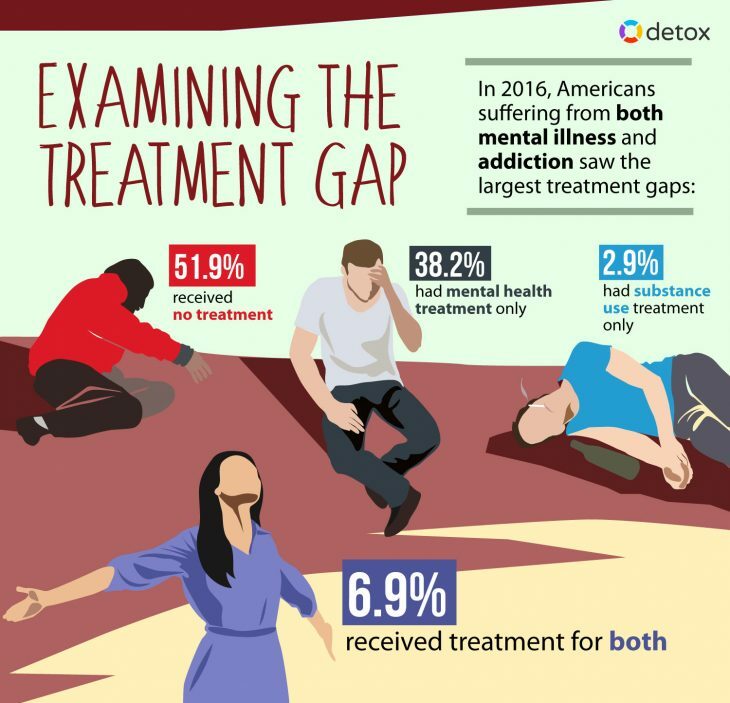 Here’s an in-depth look at the treatment gap between mental health and substance abuse, and at what the U.S. can do to help those who suffer from both conditions. The Growing Problem of Mental Health and Substance Abuse in the U.S. Despite being well-known for its advancements in modern medicine, the U.S. continues to see rising rates of mental illness and substance abuse. Anxiety disorders are the most prevalent type of mental illness among Americans, while opioid addiction continues to cause thousands of overdose deaths every year. Suicide rates have also reached a 30-year high, with experts saying lack of treatment is partly to blame. More than 43 million U.S. adults experience mental illness in any given year — which equates to roughly one in five adults, or nearly 20% of the adult population. Additionally, one in every 25 U.S. adults live with a serious mental illness — defined by the National Institute of Mental Health as a mental illness that causes serious functional impairment that interferes with daily living. Examples of serious mental illness are bipolar disorder, schizophrenia, and PTSD. Anxiety disorders are the most common mental illness and affect more than 18% of U.S. adults. Major depression affects nearly 7% of U.S. adults, while bipolar disorder affects 2.6% of U.S. adults. During a five-year period between 2012 and 2015, the number of U.S. youth suffering severe depression increased from 5.9% to 8.2%. Suicide rates have also grown substantially in recent years — rising by 24% from 1999 to 2014. Reports show that the life expectancy of people who live with a mental illness is more than 10 years lower than people without mental illness. An estimated 17.5% of deaths of those with mental illness are caused by unnatural events including unintentional injury and suicide. Additionally, 90% of Americans who commit suicide have an underlying mental illness. There are roughly 20.1 million people in the U.S. over the age of 12 diagnosed with a substance use disorder. Alcohol use disorder affects 15.1 million Americans, while illicit drug use disorders affect 7.4 million Americans. Marijuana use disorder is the most common drug use disorder affecting four million people, followed by opioid use disorder which affects 2.1 million Americans. Rates of illicit drug use in the U.S. Increased by 8.3% from 2002 to 2013, with marijuana use showing the most notable increase. In 2016 there were more than 64,000 drug overdose deaths in the U.S. Opioids like heroin and painkillers are the main drivers of drug overdose rates, and were responsible for over 53,000 deaths that same year. The rate of opioid overdose deaths increased fivefold between 1999 and 2016, and is projected to rise even higher within the next 10 years to more than 500,000 deaths nationwide. What’s the Link Between Mental Health and Addictions? The presence of both a mental health disorder and a substance use disorder is known as a co-occurring disorder or dual diagnosis. In 2016 there were 8.2 million Americans with a dual diagnosis — a 3.7% increase from 2014. About 50% of people with a serious mental illness are also affected by substance abuse. At the same time, 37% of people who abuse alcohol and 53% of people who abuse drugs suffer at least one serious mental illness. Mental health disorders can produce symptoms that are difficult to manage and that can interfere with normal everyday living, such as anxiety, confusion, and delusions. But many who suffer from mental illness will use drugs and alcohol to mask and cope with these symptoms. For instance, a person diagnosed with a social anxiety disorder may use drugs and alcohol to feel more sociable and fit in with their peers. At the same time, long-term use of drugs and alcohol can alter brain chemistry in a way that makes people more susceptible to mental illness. Children and teens are especially vulnerable, since drugs and alcohol can interfere with brain development and increase the risk for mood disorders and behavioral problems. Data shows that half of all mental illnesses begin around the age of 14 and that 75% of all mental health disorders are fully developed by the age of 24. Contact Detox.com now to find dual diagnosis treatment programs near you! Despite how common dual diagnosis is in the U.S., many Americans are only being treated for one condition and not the other. This means that people with a dual diagnosis face the risk of experiencing future problems with mental illness and/or addiction since the root cause is often left untreated. For example, those who suffer from depression and addiction can successfully complete a drug detox program but may start using drugs again later on if they want to escape feelings of sadness, guilt, and hopelessness linked to depression. Of the 8.2 million Americans with a dual diagnosis, 38.2% only received mental health treatment, while 2.9% only received addiction treatment. Nearly 7% received treatment for both conditions, while 52% received no treatment for either condition at all. The treatment gap between mental health and substance abuse can make it difficult for people with a dual diagnosis to benefit from long-term recovery. Being treated for one condition and not the other does very little to treat underlying causes of one or both disorders and increases the risk for relapse, overdose, suicide, and other serious problems. 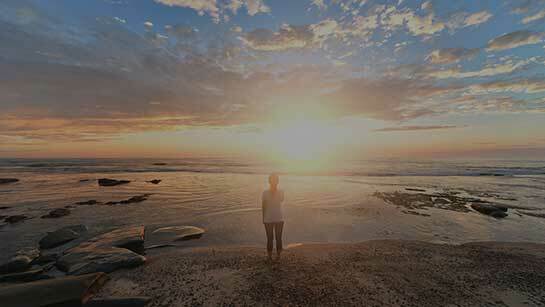 Why is an integrated treatment approach to mental health and addiction so important? Treating dual diagnosis patients for both conditions helps them achieve total recovery and improved overall health, and minimizes the effects their disorders can have on friends, family, and the community. Treating people for mental health and addiction at the same time also helps these individuals find stable employment and housing, improve their social skills and judgment, and reduce rates of crime, violence, and diseases like hepatitis C, HIV, and AIDS. 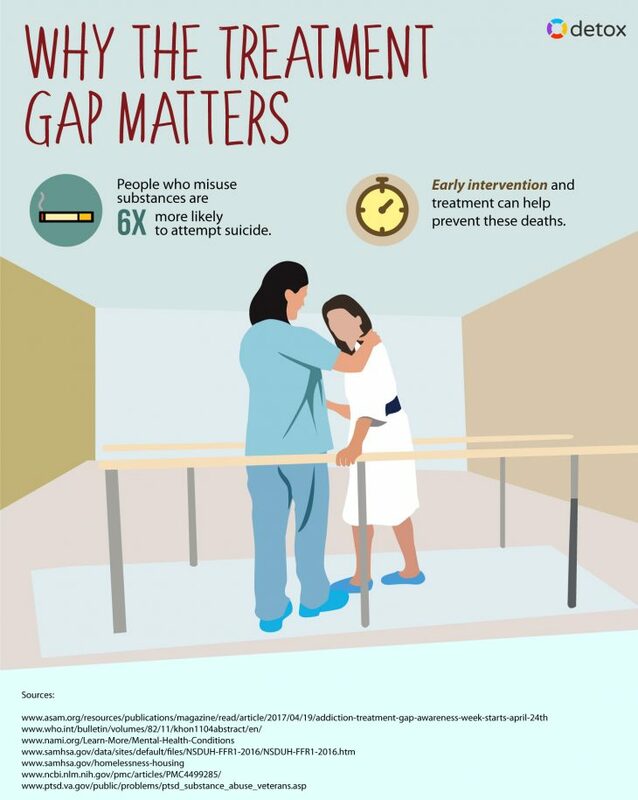 Why Does a Treatment Gap Exist? Though evidence shows a strong link between mental illness and substance abuse, many treatment centers only treat people for one condition. This happens because both disorders often have many different components that require treatment — for instance, a substance use disorder requires biological treatment in the form of drug detox, while a mental health disorder requires psychological treatment in the form of therapy. 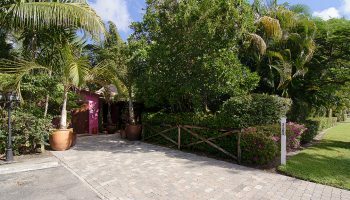 Additionally, some addiction treatment centers lack medical staff trained to treat both disorders, or have poor screening processes in place that fail to provide a proper diagnosis. 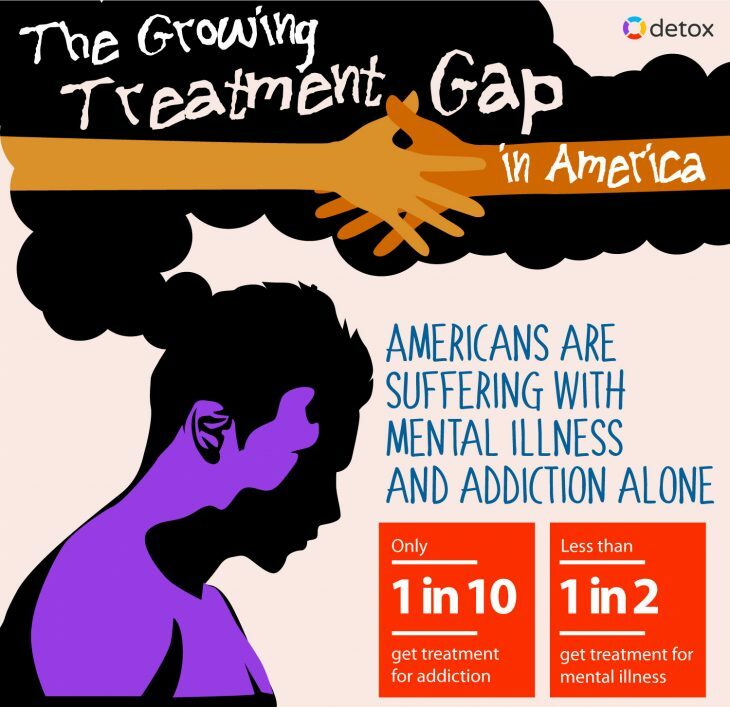 Here are reasons that lend to the treatment gap between mental health and addiction. According to the Diagnostic and Statistical Manual of Mental Disorders, a mental health disorder can be diagnosed in a drug user when symptoms occur prior to the onset of substance abuse, exist during periods of abstinence from drugs and alcohol, or continue 30 days after a person becomes sober. But this screening model can be problematic if a person has never been abstinent, or if drug and alcohol withdrawal symptoms last for several weeks or months instead of just a few days. Evidence shows that the onset of mental illness and substance abuse often occurs at the same time, or at the same period in life, usually during teen years and young adulthood. But sometimes it can be difficult for doctors to determine which disorder came first. This can cause problems for people who assume they only have just one disorder, and who seek treatment just for that one disorder. 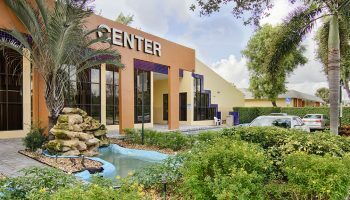 Some treatment centers simply lack medical staff trained to diagnose and recognize symptoms of either mental illness and addiction. In some cases, medical staff do not feel confident discussing mental illness with their patients, which further widens the treatment gap. Data shows that roughly one in 10 medical residents in their last year of training feel unprepared to treat people who suffer from depression and addiction. Evidence also shows that mental health professionals are often more qualified to identify co-occurring disorders than most professionals who treat substance use disorders. This means that addiction treatment centers must have trained mental health professionals on staff at all times to help with dual diagnosis and to treat these conditions in full. Many mental health disorders share the same symptoms as substance use disorders, which can make it difficult for doctors to determine whether patients are suffering from one or more disorders. For example, depression and anxiety are common symptoms of nearly every drug use disorder, while schizophrenia is a common symptom of cocaine, amphetamine, and LSD addiction. But to overcome this barrier, doctors can implement screening practices to better identify and arrive at a dual diagnosis. Therapy such as cognitive-behavioral therapy can also help patients identify the root cause of either disorder. People who suffer from mental illness and/or addiction often face a higher number of problems that make it difficult for them to afford treatment, such as loss of employment and homelessness. Plus, treatment is often significantly more costly for those with a dual diagnosis who lack access to nearby facilities that treat both conditions. Some patients are expected to pay for drug detox at one facility, and for therapy at another facility. While affordable integrated treatment options are available for nearly anyone who needs help overcoming a dual diagnosis, many people avoid seeking treatment for fear it costs too much out of pocket. How Can We Treat Both Mental Illness and Addiction? Integrated treatment for dual diagnosis has been proven effective at improving substance use outcomes, and at helping patients learn how to control their symptoms, find competitive employment, thrive in independent living situations, and establish positive relationships with non-substance users. Integrated treatment can also lower costs, increase awareness, and improve treatment outcomes for those who suffer from co-occurring disorders. Here are ways a dual diagnosis can be effectively treated. Implementing better screening practices can help people identify whether they need treatment for a dual diagnosis. Typically, people who seek treatment for substance abuse or mental illness should be screened for the other disorder at the time of intake and assessment. Many times, screenings and interviews take anywhere between five and 15 minutes and consist of a series of yes-no questions revolving around symptoms of mental illness and drug use patterns. For instance, people who get help for substance use disorders can be screened for symptoms of anxiety, mood disorders, trauma, and PTSD, while people who get help for mental illness can be questioned about substances they may have used during the last six months, including alcohol, illicit drugs, prescription drugs, and over-the-counter drugs. It’s not always easy for some society members to receive treatment for dual diagnosis — especially those who already face stigma for being homeless or incarcerated. But these individuals often need more help than others due to the ripple effect their illnesses can have on public safety and local communities. Of the 600,000 Americans who were homeless in 2016, more than 202,000 suffered from mental illness and/or addiction. 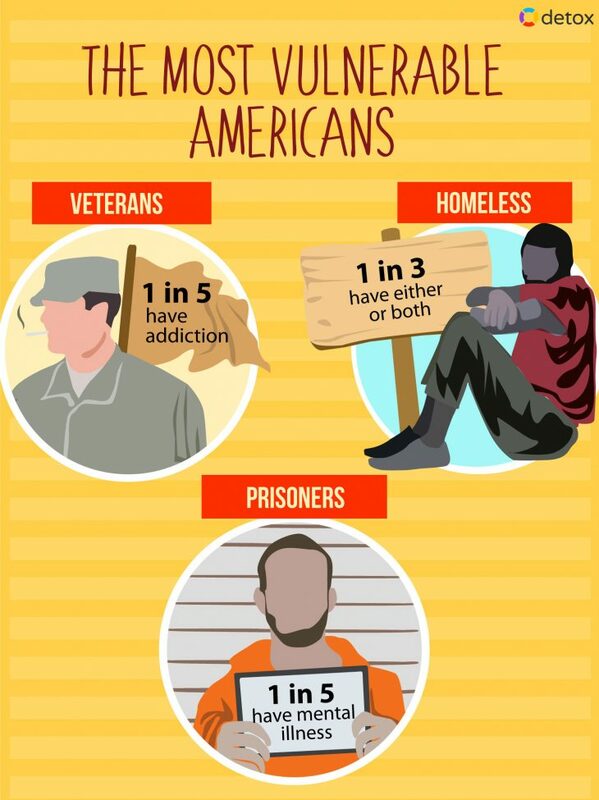 One in every five U.S. veterans have a substance use disorder, while two in 10 veterans suffer from both PTSD and substance abuse. An estimated 20% of people in prison suffer from mental illness, while recent evidence shows that people with drug use disorders are six times more likely to attempt suicide than those without drug use disorders. Vulnerable members of society need increased access to integrated treatment, which can be achieved through routine screening in every setting — including prisons, homeless shelters, and primary care settings. Doctors who treat veterans are encouraged to collaborate with organizations that specialize in treating PTSD and substance abuse, such as the National Center for PTSD and the National Institute on Drug Abuse. People who self-medicate their mental illnesses using drugs and alcohol often lack education surrounding the long-term effects of substance abuse on their overall health and well-being. Or, these individuals may feel as if self-medicating is their only way to find relief from certain symptoms, or that self-medicating is far less costly than treatment. Communities and local organizations can implement programs for individuals who self-medicate so they can feel more empowered to seek help and treatment and prevent substance abuse from turning into a full-blown addiction. Though health disorders like depression and addiction are widely recognized as legitimate diseases in the U.S., stigma continues to prevent many from talking about their struggles and getting the help they need. But removing the stigma from mental health and substance abuse can help steer people toward the path to recovery. Remove the stigma surrounding dual diagnosis by replacing negative attitudes about mental illness and addiction with science-based facts, and listening to the stories of these individuals without passing judgment. Addiction and mental health can affect anyone regardless of age, gender, and background — including people you care about the most. The perceived cost of dual diagnosis treatments can often prevent people from getting help. But funding is available for addiction treatment centers on behalf of grants and local, state, and federal funding. If you run an addiction treatment center, look into receiving grant funds from the Substance Abuse and Mental Health Services Administration. If seeking treatment for yourself or a loved one, check to see whether your health insurance provider can cover some or all treatment costs so you or your loved one can get treatment as needed and deserved. Call our 24/7 confidential helpline at 800-483-2193 to speak with an addiction counselor about the best drug detox centers in your area that can treat a dual diagnosis. 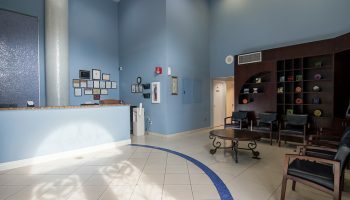 We’ll help you find a treatment center that offers detox, therapy, and mental health services so you can overcome both disorders as a whole and benefit from improved health and sobriety.